Welcome to the World of Torlenth! Once each month we will showcase a new element in the World of Torlenth. From people, to places, and even to things that go munch in the night, you will never be disappointed in what you find out about this world. Okay, folks. It's time to put a new face on the Torlenth book set and you can help. 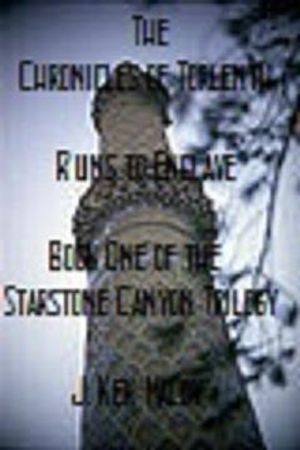 We are holding a contest for the new cover art for 'The Chronicles of Torlenth -- Ruins to Enclave -- Book One of the Starstone Canyon Trilogy.' As we get entries, we will post them here. We will factor in the number of Likes and the number and type of comments a piece gets as we go forward with the judging. The winning artist will receive one free copy of the book in their favored eBook format bearing their artwork, as well as one free copy of each book as they come out. On top of that, the winning artist receives, at the time of confirmed sale at Amazon.com, $500.00 (five hundred and 00/100 dollars) once 'The Chronicles of Torlenth -- Ruins to Enclave' reaches one thousand (1,000) units sold. Providing 'Ruins to Enclave' goes to hard-copy, the winning artwork will remain as the cover art and the winning artist will receive, at the time of confirmed sale via the publisher, $2,000 (two thousand and 00/100 dollars) once 'The Chronicles of Torlenth -- Ruins to Enclave' reaches ten thousand (10,000) units sold. In addition, the winning artwork will become the new cover art for 'The Chronicles of Torlenth -- Ruins to Enclave -- Book One of the Starstone Canyon Trilogy' and be featured here. The winning artist will automatically be added to the list of finalists in future cover art contests. All entries will become the property of Crozier-Cross Productions. Submitted artwork (herein known as 'Submission') must be created by the artist (herein known as Entrant')making the Submission (Entrant may submit another artist's work); an Entrant may make multiple Submissions, providing that only one piece of artwork per Submission may be submitted at a time; multiple Submissions of different pieces of artwork from the same Entrant are encouraged and welcomed. Submissions may be in any visual medium (including but not limited to paint, pen and ink, pencil, photographic). All Submissions, upon receipt, become property of Crozier-Cross Productions (herein known as 'CCP') and all human and non-human likenesses of any and all models used will become property of CCP. Send the Submission as an attachmewnt to the email. Type "ENTRY" into the subject line. In the body include your name, contact information, the name of the Submission (if any), and the medium in which you worked. Submissions must be electronically submitted to [email protected] no later than April 16, 2014. The winner will be announced July 16, 2014. All you have to do is submit original artwork based upon the sample of The Chronicles of Torlenth (located here: http://www.amazon.com/Ruins-Enclave-The-Chronicles-Torlenth-ebook/dp/B009Y8UX92#reader_B009Y8UX92). It has been over ten thousand years since the final throes of the Great War when the world of Torlenth had faced a seemingly endless global civil war. The Great War’s origins came from the slaying of Dowser, the last chaos dragon and First Follower of Ortrekth, the prismatic god and creator of all dragon-kind. Endareth, the phoenix-winged god, flayed and cast into the Great Void Etyrnys his own brother Ortrekth for the crime against his own First Acolyte. Having reacted thus to the slaughter of Dowser, Endareth had caused a schism in the pantheon and forced the gods into a state of non-interference regarding the lives of their own followers. During those many years, however, a sect of Ortrekth’s followers, cursed to bear markings similar to those of their now-skeletal deity, have sought out ways to bring their dragon god back to the power he had held before being cast down by Endareth. in order to secure their possession of the metal. A small band of warriors, led by a druid with no memory of his past, make an effort to thwart the bestial hordes from taking Starstone Canyon, unaware of the metal and the ancient evil they have crossed in their endeavor.